Traditional Ukrainian cuisine is an integral part of the country’s culture and a permanent symbol of the hospitality of its residents. Formed over centuries, and absorbing culinary traditions of various peoples, Ukrainian cuisine turned into one of the richest and the most diverse of Slavic cuisines. Many of the dishes – simple, yet exquisite – have distinguished themselves with their amazing taste and gained international fame across the world. Ukrainian cuisine’s popularity stems from its variety of components and their unique pairings. You will often see vegetables on the table, including potatoes, beets, cabbages, marrows, eggplants, and tomatoes. They are used for cooking complex dishes and salads, but most often they are served as a garnish to the meat dishes. 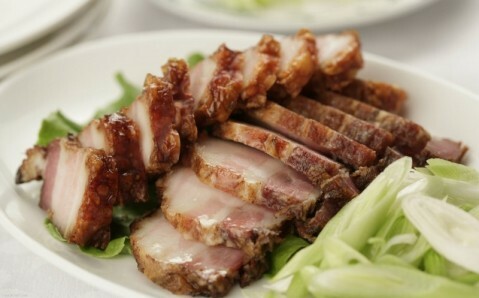 Speaking of meat, preference is given to pork, and, of course, to the beloved 'salo' (pork fat), which has for a long time enjoyed the unofficial status of the main national dish. Ukrainian cuisine cannot be imagined without various kashas, cooked from cereals and beans. These are simple and nourishing dishes that peasants have eaten for ages in order to replenish their stamina. Ukrainian diet can rarely manage without fish dishes: they are incredibly intricate and delicious. Carp stuffed with mushrooms and buckwheat, pikeperch stewed in sour cream, and fish 'krucheniks' are among the most popular seafood dishes. Baked goods occupy a special place in the Ukrainian cuisine - curd or fruit dumplings, blinis, cottage cheese patties are all incredibly popular. National Ukrainian cuisine also uses fruits and berries, the most common being apples, plums, cherries, raspberries, cranberries. They are added to kashas, used as filling for pies, and, of course, boiled into the most famous national dessert, 'povidlo,’ which is like jam or marmalade in European cuisine. Although the cuisine is mostly homogeneous throughout the country, each region is famous for its own culinary extravagances. In the west, it is typical to use mushrooms (especially porcinis) and berries, which are found in the rich Carpathian forests. One of the most popular dishes in the western regions is considered to be 'banosh' - kasha made of corn flour (hominy) – that is called the soul of the Guzul cuisine. Guzuls often serve banosh with 'brynza,’ which is cultured milk, reminiscent of something between cottage cheese and feta cheese. And in Crimea, besides the traditional Ukrainian fare, you can try Tatar dishes, which is also famous for its unique culinary traditions. The most widespread dish here is 'shish kebab,’ and the well known eastern sweets. But regardless of the region, there are several dishes that are the quintessence of Ukrainian cuisine. Borsht. 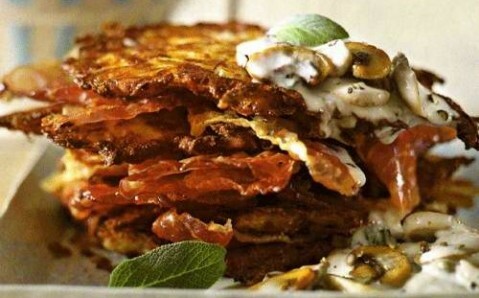 This is one of the most picturesque, and definitely the most popular Ukrainian dish. It has caught the fancy of the entire world with its unique taste and aroma. Since many tourists mistakenly associate it with Russian cuisine, Ukrainians usually stress that it is they who discovered borsht. 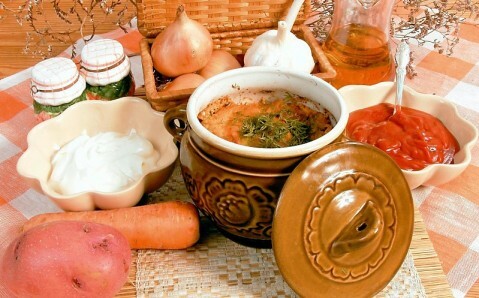 Ukrainian borsht is a beet soup which is cooked with beef broth and vegetables: potatoes, beets, carrots, onions, and cabbage; it is topped off with tomato paste afterwards. In different regions of the country, other ingredients may be added to this dish, which only adds a special nuance to it. 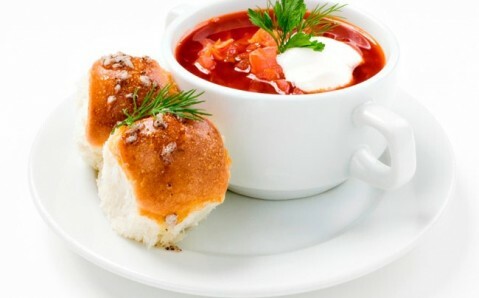 Traditionally, borsht is served with 'pampushkas' - small buns covered with garlic sauce and sunflower oil. Salo. Along with borsht, salo is the symbol of the Ukrainian cuisine. Locals very much appreciate salo for its unusual taste and nutritional properties. Salo is used to cook various dishes, but it is also served as dish on its own. Salted salo with pepper is considered to be ideal appetizer. Vareniki. It is no surprise that in Ukraine, which is called the breadbasket of Europe, dishes made with flour are popular. And vareniki are - without exaggeration - the most popular and the tastiest among them. They are made of unleavened dough with various stuffings - berries, cottage cheese, cheese, potato, or cabbage. Then, they are boiled in salted water. Ukrainian vareniki are in some way reminiscent of Russian pelmeni (meat dumplings) and Italian ravioli. They are usually served with sour cream or cracklings. Stuffed cabbage rolls. Another characteristic Ukrainian dish is stuffed cabbage rolls, usually filled with a meat and rice filling and stewed in tomato sauce. 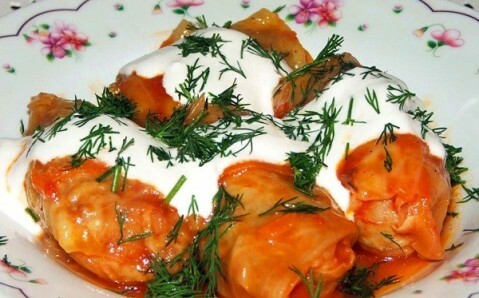 Stuffed cabbage rolls are traditionally served with sour cream. Deruni. Although deruni - potato blinis or pancakes – can be found in many Slavic countries, in Ukraine, this simple and tasty dish acquired such popularity that it became a permanent component of national cuisine. 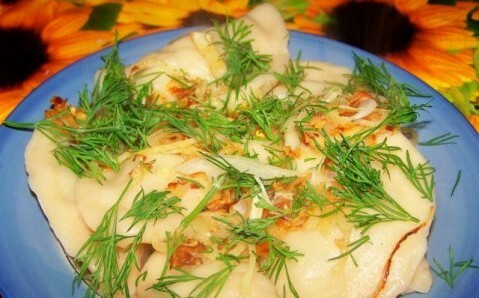 The dough for deruni is usually made of grated potato, with eggs, onions, and flour. It is then baked on the pan. Traditionally, they are served hot with sour cream or butter. Kulesh. This is an ancient Ukrainian dish, which became widespread thanks to the Zaporizhian Cossacks. They valued this pottage, cooked with millet, salo, potato, and onion, for its simplicity and incredible richness: during raids, kulesh often replaced a full course dinner. Modern Ukrainian cooks have significantly diversified the Cossack's casserole, having added new ingredients to it: mushrooms, meat, and kidney beans. Kulesh cooked on open fire is considered to be ideal, but pottage cooked at home is not inferior in its taste to this ancient original. Ukrainian beverages deserve special attention. Naturally fermented drinks are considered to be the most popular. Among alcoholic drinks, the most popular are beer and wine (especially Crimean and Carpathian). Among the non-alcoholic, kvass is known for quenching many Ukrainians’ thirst. 'Uzvar,’ a refreshing drink made of dried fruits and berries, is very popular in the country. And, of course, we cannot forget 'horilka’ – Ukrainian vodka, without which no feast can begin. However, you need to be very careful drinking 'horilka' since it is a rather strong drink. Ukrainian national dishes and drinks - always cooked with soul and served with love - have never left any of Ukraine’s guests indifferent to their charms. Delicious and nourishing, they have become a real trademark for the country. Even though today some Ukrainian dishes have become staples on the menus of many restaurants worldwide, their original taste and unforgettable aroma can be experienced only in Ukraine!